Patty has some very strong ties to the Orlando community. She not only lived there for many, many years, but she went to college there (at the University of Central Florida), worked there, got married and had both of her children down there. So, as you can imagine, the Orlando tragedy is very near and dear to her heart. The Orlando Modern Quilt Guild is collecting rainbow heart quilts and/or heart blocks to donate to the surviving victims (many of which are still in the hospital fighting for their lives) and the families of the deceased. Patty and her daughter, Sydney, will be sewing up some quilt blocks and they are inviting you to participate as well. You can find all of the details for the Pulse Donations here. 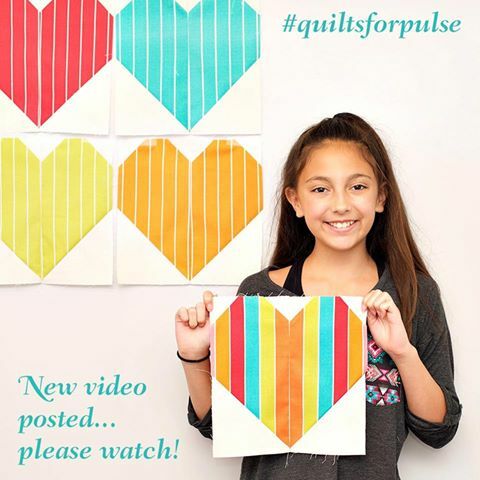 Sydney even created a great video tutorial for creating the quilt block!! Sew with them for a great cause! !